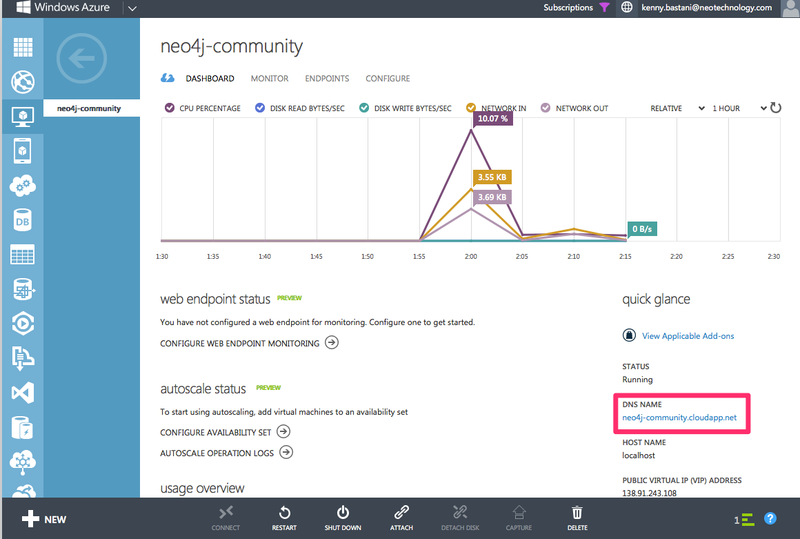 We have released a Linux distribution of Neo4j 2.0.1 community on Windows Azure’s VM Depot website. Users of Windows Azure are now able to copy a platform image of Neo4j 2.0.1 directly from the VM Depot. Once provisioned, a fresh Neo4j database instance is made available via HTTP through port 7474. Check out the slides below for instructions on how to setup and provision the virtual machine image. Additionally, I wrote a separate blog post here with instructions. Hello Kenny. I’m having problems installing Neo4j 2.0 VM image on azure. Browser is not showing. I’m getting this error in chrome: ERR_CONNECTION_TIMED_OUT. Help me! Thnxs! Any plans to have an updated VM image for Neo4j 2.23 version? You might consider updating this post now that Microsoft (two years ago) merged Microsoft Open Technologies back into the mother company.